This playful science centre is 30000m2 and the first 3D Planetarium in the Czech Republic. It’s a fantastic place not only for kids but also for parents. What I really like the most is, that it is fun even for the smallest kids. There is a special play area with spongy blocks and I was so tempted to jump in. It is truly education and fun combined together. Make sure you go for the whole day. There is a lot to do. It’s restored, historic building was the premises of the SKODA Company, this brand new urban space is close to the city centre. And… they invested 1 billion CZK (which is about 37 Mil. EUR) WOW. When you get to Techmania in Pilsen (about 100km from Prague) make sure you park in the official parking lot. The local Police are targeting visitors from all around the country who often park on the main road next to the complex and fine each and every of them. Not sure if they did this on purpose, but they hid the NO PARKING sign very well and if I haven’t been told by my Mom, I would for sure end up with a fine. The parking lot is right in front of the complex. If you travel by other transportation then you won’t have this worry. It’s better to visit in the morning. We came after lunch and the majority of special education programmes were booked. I booked Marcus for last the spot in the Science Session - How to survive in Space. I had no idea what to expect. They told me to bring him to the reception at the exact hour, then he will be collected and taken to a special room. I did just that and continued with Nicolas around the Science centre. Completely puzzled, together with another 10 people who had exactly the same items. They were all told to create a filter that will filtrate the air after connecting it to a hoover, as the Apollo 13 crew did when they lost their filter. That was how they would survive…. now that was a challenge. The kids simply had no idea what to do. I was a bit upset about the session, because I thought they will take Marcus (8yrs) off my hands and possibly, explain him and help him in such quest. Sure, it made him think, but seriously, I don’t think it was appropriate for his age. One boy of the same age left on his own, he gave up straight away, so we adopted him and I stayed the whole session. They offer programmes in Biology, Chemistry and Physics and different workshops. I haven’t tried them, but for sure they are suitable for older kids. The Biology sessions sold out very quickly. The centre has created a very special planetarium. It is the first 3D Planetarium in the Czech Republic because it enables full dome projections in 3D. It is a great experience just to enter the house: modern technology from the Sky-Skan company set up in a historical building from the year 1917 creates an unique example of genius loci. 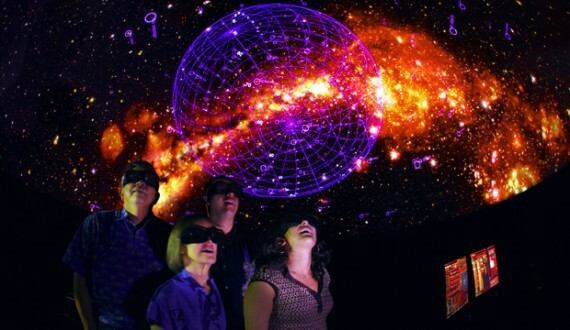 There are three main features in the 3D Planetarium. First, the 2D and 3D full dome projections offer great variety of educational movies. The Space exhibition, containing 27 interactive exhibits made by the team of Techmania, guides our visitors all around the space and its exploration. Like the Space suit you can enter form behind and take a picture :-) Its a nice souvenir to have. Yes, there is a restaurant in the main building where you can comfortably eat. But, take water with you. Kids do lots of running around there and… to my surprise, they were cold. We came in shorts and I wished I had sweatpants for them.